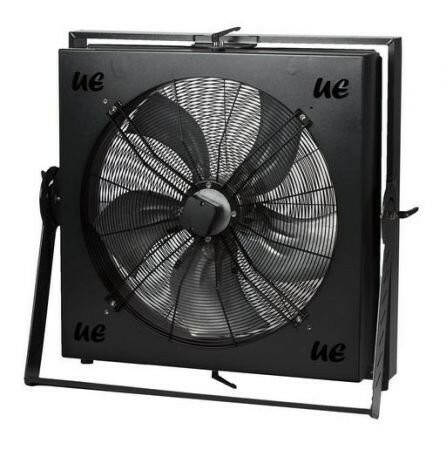 The new wind machine UE K-Base 800 was designed so that you can create a large volume wind effect, featuring a low noise and a simple implementation. It is supplied with a wind head that can double the efficiency distance. When the head is removed, the coverage area is very large. This base can be orientated around 2 axes (horizontal and vertical axes) whatever it is hung up or used on the floor. We recommend to use it with our optional DMX frequency inverter, so that you can perform a precise adjustment of power. ALUMINIUM support and STAINLESS STEEL screw-works, the UE K-Base 800 is a durable product. Each component was selected keeping in mind its quality and its efficiency. Last generation ventilation technology. Attachment under a structure and floor use with a double-U support are possible. New multi-effect heads available soon.